To prepare the chicken, slice each breast in half on an angle. Butterfly the thicker half. Using the flat side of a mallet, gently pound each piece just until it is about 1/3" -inch thick. Set aside. To set up your breading station, first grate the Parmesan cheese. Mix the cheese and the Italian breadcrumbs together. Place half of the breadcrumb mixture into a shallow bowl. It’s best to use the breadcrumbs in stages, as you may not need them all. In another shallow bowl, whisk the eggs until evenly blended. Place the flour into a third shallow bowl and set everything aside. Before breading the chicken, preheat your oven to 375º degrees Fahrenheit (or 190° degrees Celsius). To bread the chicken, generously season both sides with salt and pepper. Coat each piece with the flour and shake off any excess. Then dip the chicken into the egg mixture. Allow any excess to drip off before placing into the breadcrumbs. 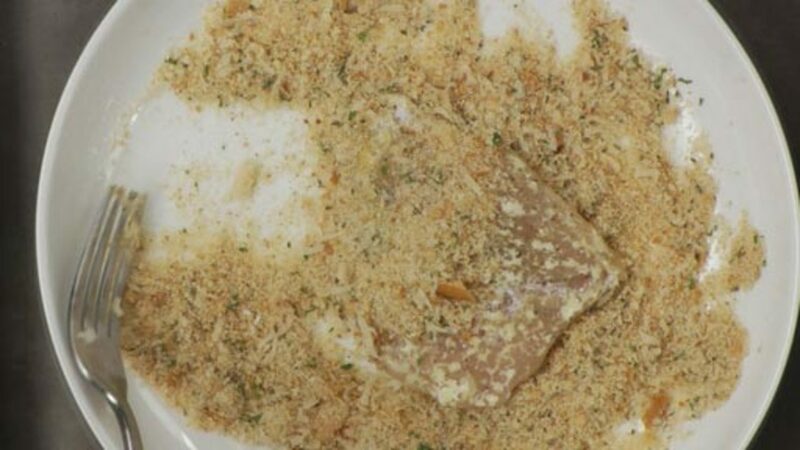 Cover the chicken with the crumbs, pressing them into the chicken so they stick. Transfer to a baking tray. Add more breadcrumbs, as needed. 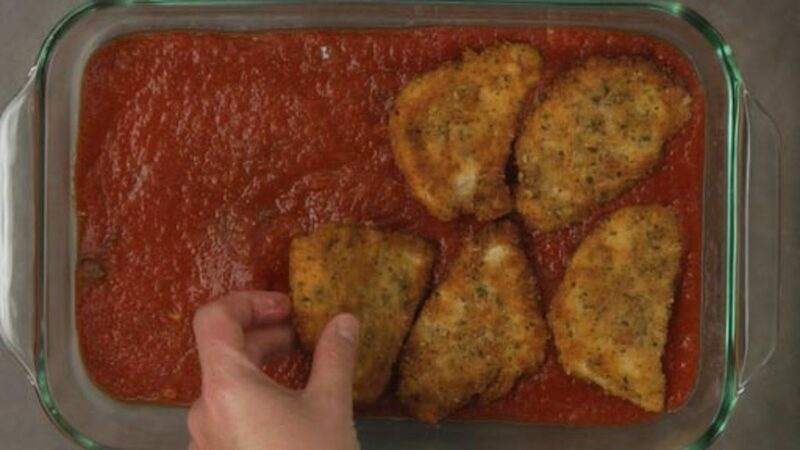 Once you’re finished breading all of the chicken, set it aside while you heat the tomato sauce. Pour the tomato sauce into a medium pot and bring to a simmer over medium-low heat. By preheating the tomato sauce, this allows the dish to cook quickly in the oven, which prevents the chicken from being overcooked. Once it comes to a simmer, turn off the heat and set aside while you fry the chicken. In a large, nonstick fry pan add the oil and heat over medium-high heat. Test the oil by adding a breadcrumb to see if it sizzles. If the breadcrumb sizzles and turns golden, the oil is ready. Place the pieces of chicken into the pan facing away from you in case the oil splatters. Once the underside is nice and golden, gently turn over. Continue to shallow fry the chicken until it is golden on the other side. This should only take about two minutes per side. The chicken doesn’t need to be cooked all the way through, as it will finish baking in the oven later. To assemble the dish, first grate the cheese. 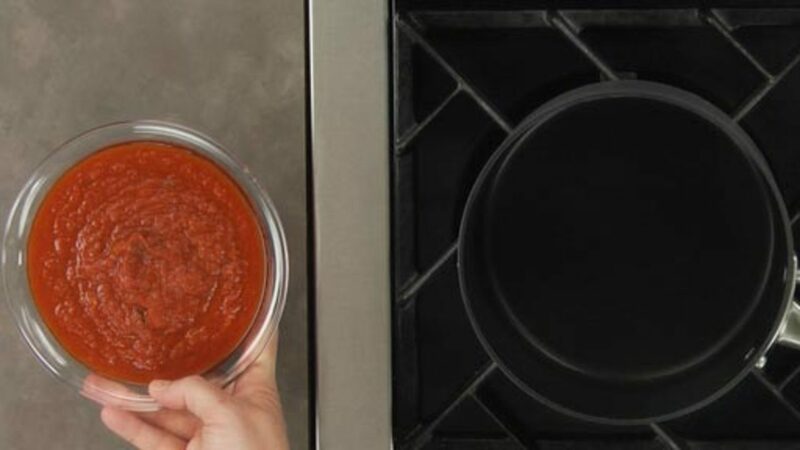 Cover the base of a large baking dish (9″ × 11″ -inches) with about 2 to 3 cups of the tomato sauce. The layer of sauce should be about 1/2" -inch high. Place the pieces of chicken into the sauce, shuffling them around a bit if needed so they lay somewhat flat. Next, spoon a couple of tablespoons of the sauce onto each piece, followed by a bit of grated cheese. Bake for about 10 to 15 minutes or until cooked and heated through. If desired, you can turn on the broiler for the last 2 to 3 minutes of cooking to slightly brown the cheese. Serve family style with a nice big salad, some fresh pasta and enjoy! There are many variations of this dish. Some recipes add or substitute Parmigiano-Reggiano (parmesan cheese) for the mozzarella (this could explain why many people think it is called “Chicken Parmigiano” instead of “Chicken Parmigiana”. Where the name comes from is a bit of a mystery; some say it originated in Parma, Italy and some say it is named after a Sicilian recipe, called “Parmiggiana”, which is fried eggplant, tomato sauce and mozzarella cheese. No matter where it comes from, or how you make it, it is simply delicious. It is always a pleasure to have great success with the first attempt at a new recipe. I had never thought of adding salt (I used sea salt) and fresh pepper to the chicken before cooking. The entire family voted this dish as a must-have favorite. My husband said I should be proud to serve this to any Italian! It was really good. I made the tomato sauce using the paste you show in the drill down. It says it is double concentated so I was a bit unsure of the amount needed but figured this is not an exact science and the end result was great. This was really easy to make, especially since you didn't have to keep tabs on the chicken in the pan. You just had to take it up when the crumbs had browned. 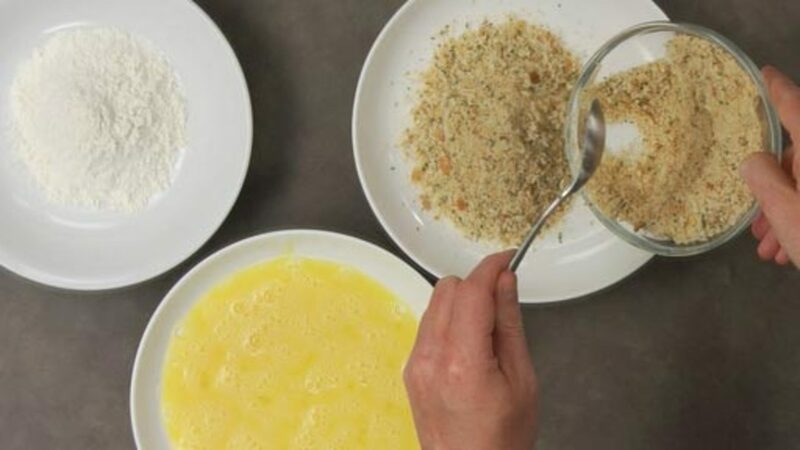 I wonder though, is there any particular reason for the flour step before the egg and the breadcrumbs? Seemed a bit pointless when you added the breadcrumbs right afterwards. Oh I forgot to add. I made way too much (3 chicken breasts for 2), so I had enough for 2 lunches and a dinner for myself afterwards. My preferred method of serving was to heat the chicken and put it inside a burger bun with a bit of the sauce. Anyone have suggestions for good sides to go with it. I guess pasta is an obvious choice, but any others - maybe a vegetable? I think that the lemon garlic rapini would go very nicely with this. http://rouxbe.com/recipes/48/preview Also the braised kale would be nice. http://rouxbe.com/recipes/1833 Or the roasted cauliflower http://rouxbe.com/recipes/928/preview And yes indeed you are right this dish is particularly good friends with pasta http://rouxbe.com/recipes/1060/preview Hope this helps! The pasta was amazing with this, which was also wonderful. Thanks for the suggestions. I made this recipe two nights in a row for groups of 14 and 10 and it came out fantastic. I promised a friend I'd make it for her birthday, and realized that normally when I follow recipes something gets messed up so I might as well do a practice run for friends at school. Both times I got nothing but complements. I made this dish, along with the recipes on this site for brown sugar roasted carrots, roasted cauliflower, spaghetti with oil and garlic, and served the french fries as appetizers. Everything was wonderful. I made this last saturday and my husband and I loved it!! The tomato sauce and the breadcrumbs really made this dish. Thanks for the recipe! i made this dish last night and it was great! i am very much a beginner when it comes to cooking but this first experience was great. and my husbnd liked the dish! yay! If I used eggplant instead of chicken, what steps should I do differently? Cut the eggplant - one with shiny skin and firm - into 1/4 " thick rounds (skin on). Salt liberally for 30-45 minutes, then rinse and pat dry. This removes bitter juices and softens texture of the eggplant. Season and proceed as with chicken. Fry until eggplant is tender, then bake with sauce and cheese. Great stuff! Thanks, Tony. What does "salt liberally" mean? Also, would the baking temperature or time be different if using eggplant? A good pinch per slice of eggplant. Even if you think you're over-salting, the salt will be rinsed off. It simply removes bitter flavours. Bake at 400 F until cheese melts, bubbles, and goes golden. Remember that with baking temperatures, unless you're baking souffles or cakes, the oven temp can be anywhere between 350-425. It's then a matter of watching for the indicators that you're done. This is a delicious recipe! Simple! The whole family loved it and even my pickiest eater drooled (20 year old pregnant daughter). I made it pretty much as the video explained. I am enjoying what I am learning here and contemplating staying around for a while. My pan was a little small or i had too much chicken but that small inconvenience was over shadowed by how awesome it all came together! I'm single and so I often end up just cooking for myself. Any suggesting on modifying the recipe for just me? I'm open to possibly making more and freezing it at some point during the process. This recipe is easily scalable, so feel free to make either half or less than the full recipe. Also the tomato sauce can be made ahead and frozen into smaller portions. The chicken can also be cut ahead and frozen into portion-sizes...this way you can make a small batch whenever you feel like it. BTW - any leftovers of the dish will last for a couple of days in the refrigerator and they are super tasty. Hope this helps! Hey awesome recipe! So Glad I found Rouxbe, but does parmesan cheese always have to be aged, and if so does it always have to smell and taste like.. poop? Because mine does and im thinking its just because its probably not that high quality. I did this recipe all the way including the bread crumbs and souce. In israel its usual to eat breaded chicken breast so it felt a little bit shame to loose the crispyness of the crumbs due to the souce. nether the less it was yami. Can you stop after you fry the chicken and assemble and refrigerate to cook later in the day? Thanks! It is not really recommended to make this ahead of time. It is best to fry the chicken, assemble it and cook it while it is hot and the crust is still crispy. If you were to assemble ahead of time, the sauce would also make the coating soggy. To help you get ahead you could, make the sauce, prep the flour mix, grate the cheese and just get yourself ready for when you can cook. If you really must do some ahead of time you could fry the chicken and then assemble just before baking, but keep in mind you will not likely get the exact same results - but feel free to give it a try to see for yourself how you like it. Hope this helps! I've used these to bread fresh Pickeral fillets. Yummy with a squeese of lemon. Hey Rouxbe, I was wondering whether this dish works as well with chicken thighs? I regularly substitute thighs for the breasts with great success Robert in almost all the chicken recipes,(including this one), as this is the meat my husband prefers. Because I had way more chicken left over. This recipe is awesome though. I can't cook but after I made this my wife thought I could be a professional chef LOL!! A few things though: 1) USE THE RECIPE ON THIS WEBSITE TO MAKE YOUR OWN SAUCE (IT'S ABSOLUTELY AMAZING) 2) If you want to make it easier, make the sauce a day ahead. You can use it for other things later. 3) Definitely use the broil option on your oven to finish it. (They say it's optional but I really do recommend it.) Great recipe, I made this with a light salad and some bread with olive oil. Perfect dinner. The second cheese is mozzarella. It is in the text recipe. BTW, this recipe is fantastic! Anne is correct. Step 2 of the text recipe indicates Parmesan cheese, and Step 6 of the text recipe indicates mozzarella cheese. Cheers! Just to follow up on my chicken thigh comment. I made the dish with thighs and found that I did not like it as much. I found that the thighs were too juicy for this dish (as I'm used to it). Don't get me wrong, it wasn't a disaster or anything like that, but it just didn't have the right consistency in my book. Any suggestions or comments? Good for you for experimenting. Sometimes certain dishes just require specific ingredients to satisfy the "idea" of the dish. For example, you might go to a restaurant and the description on the menu doesn't match what is actually served - it can be really disappointing if you get something that you don't expect. Hope that makes some sort of sense :) I'd stick to chicken breasts for this dish. Cheers! I have made this recipe now four times and it comes out wonderful everytime. Everyone in my family, including three teenagers scrapes their plate. The sauce is for sure worth the effort. I made it one time and took a short cut on the sauce and it made a big difference. Thanks for such a wonderful dinner! I made this recipe with eggplants for eggplant parmigiana instead of chicken parmigiana. It was great! I served a simple salad consisting of mixed greens, sectioned oranges, scallions, and oven roasted garlic with balsamic vinegar to begin. Then served the eggplant parmigiana with fresh pasta and it was a hit with my family! I absolutely loved it! Next time I make this, I think I will use veal for a nice twist. Thank you Rouxbe for the great knowledge that you are passing on to me! What is the difference between this and regular chicken parmesan? There really is not difference. 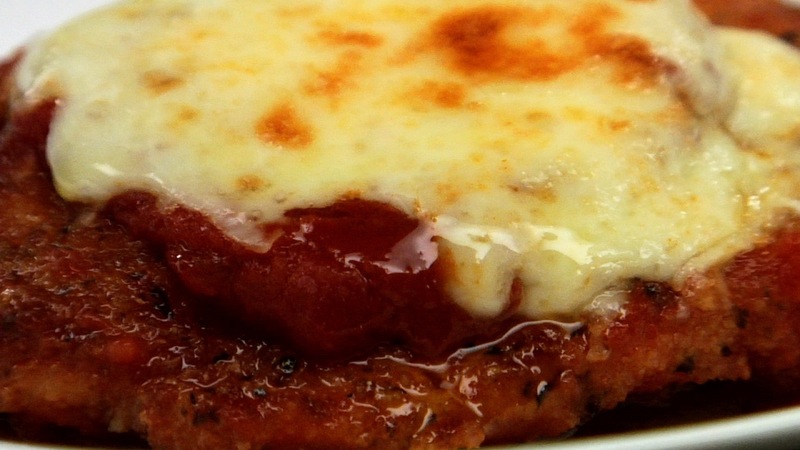 Parmigiana is Parmesan cheese, so it's basically just a fancier name for the same thing. Cheers! Everything was going great. The chicken looked delicious. Then I put it on the sauce with a dollup of sauce on top + cheese &amp; baked it for 10 min. It tasted good, but all the wonderful crispiness was gone. I'm not sure what the baking step really accomplishes, other than melting the cheese and perhaps cooking the chicken more. Next time, I think I'll bake the chicken on a wire grid to melt the cheese and not in a baking dish on top of the marinara. Then I can add the marinara on the plate when serving. I hope I can keep the crispiness by doing so. The crispy crust does soften but if you would rather it stay crispy then your idea sounds good. Let us know how it turns out. Cheers! I am not a big fan of side dishes. I had some leftovers after serving with a side of pasta, so I had an idea. I shredded some lettuce. Took a tortilla (wrap) and melted some mozzarella onto it. Next I put the tomato sauce on it. Added a little lettuce and sliced the beautifully crispy chicken into finger sized pieces. Made for an excellent snack on the go. i try this,can i use other cheese?and bread crumbs? That is the great thing about cooking, you can always experiment. Good luck - cheers! it's father's day after all and this is my husband's favorite dish, which of course I hate. So I let him know years ago after he made it for me for the first time, if he wanted Parmesan chicken, like ever, he'll have to get it at a restaurant. How amazingly simple and quick was his recipe! All you did was combine a bag of frozen breaded chicken breasts, cut off a hunk of mozzarella, open a jar of spaghetti sauce, throw it all in the oven and viola! Parmesan chicken!... (like where's the Parmesan part?) He did on occasion get me to try his ordered Parmesan chicken entree at a restaurant and still, I could never fathom why the Italians would do this to a chicken. But since Rouxbe has shown me many foods I avoid like the plague are actually not only good but incredibly delicious, I can only say I was not disappointed. Man-o-man!!! This was so good, my husband (who thinks he's the king of making Parmesan chicken) kept looking at me suspiciously as he ate and finally asked in a low almost defiant tone, "What did you put in this chicken to make it taste this good?" As if anything in the world could taste better than frozen Tyson Chicken? I was speechless. I felt like I was guilty of some kind of homeland security culinary breach. Nope, no state secret here. Just the magic of FRESH INGREDIENTS, love, passion, anticipation, mixed with a little fear, apprehension and Rouxbe as my guide. I still may never order this at a restaurant again, but definitely will add it to my favorites to make at home again and again! And to think, this is only going to get better as I practice. Not bad for my first attempt at this dish! Thanks Rouxbe!! Hi Lynn! Welcome! Before Rouxbe my family would run when I announced dinner was ready. Now they ask, "What's for dinner!?" You are gonna love it here! Especially if you are already a pretty good cook because they demystify why your dishes can be perfect sometimes and others not so perfect. This is cooking by technique. A world of possibilities open up when you understand those techniques. Your creative confidence and trust in yourself writing your own recipes is going to skyrocket. Congratulations on your first dish! Careful, this place is addictive! i had my sisters' family over for dinner. I'm not sure what I was thinking- attempting to make this for them as my brother-in-law is the pickiest eater I know and happens to be Italian... He loved it, the kids loved it. My brother-in-law actually had 3 servings. Going to make it tomorrow night! Thx Rouxbe! This was fantastic! I made the sauce and the chicken-everything homemade with the highest quality ingredients. Simple food, properly seasoned, never tasted so good! Thanks you! Thank you Patty T and Dawn! I've never made this from scratch before and wasn't sure if I had done something a little bit off to make it less crispy than I had expected. Your idea of putting the sauce on the plate sounds wonderful. Also, thank you for this wonderful recipe. I have always used the Tyson trick too LOL. This is much better. Am I to assume that the chicken breasts in this recipe are without a brine added? I remember the brining lesson and remember how wonderful the chicken tasted after brining. However, with the cuts of meat being so thin, was not sure whether the brining would help, or hinder the flavor. Thanks! Personally, I would not go the extra effort of brining the meat for this recipe. The meat stays moist and tender as it is nicely protected by the crust as it cooks. There is also enough flavor from the seasoning, tomato sauce and cheese to ensure the chicken is far from bland. Hope this helps. Cheers! I made this tonight. Never has my breaded anything came out perfect. It did this time. The more I practice with these wonderful RouxBe recipes, the less appealing the store-bought versions of these meals are. The confidence in my cooking has increased a thousand-fold since I joined here over a month ago. The chicken parm has become another must-have in the household menu. I've made this 3 times since I joined Rouxbe. 1st, by following the recipe, not knowing anything. 2nd, after taking the courses and fully understanding what I'm doing 3rd, continue to practice what I'm learning. And the dish was better than the last time! Also made this with eggplant and it was pretty nice too! Any tips on what might work best for making this gluten free? GF breadcrumbs are obvious, but I'm more wondering about what kind of flour to use. I've been thinking about using quinoa flour in most of my flour replacements. Starches such as rice flour or cornstarch could be used. You may find the lesson on Breading and Battering helpful. Cheers! I don't have a large nonstick pan so would a steel pan be suitable? And would it be quite so different from a nonstick? Thanks!! A large, stainless-steel pan will also work for shallow frying (see the lesson on Shallow and Deep Frying). Once breaded, it is best to let the breading set for about 10 to 15 minutes prior to frying. Any longer and the breading will start to turn soggy (refer to the lesson on How to Bread and Batter Foods). Cheers! This recipe is much easier than I had expected, I was anxious since I was hosting a big family dinner -- about 30-ish pieces of chicken to bread, fry and bake. It was incredible thanks to Rouxbe! :) My only complaint about this recipe is now I'm hosting Christmas dinner because of it. Thank you Rouxbe folk, you're amazing as always! Made this for dinner tonight and it was a huge success. The family loved it. Started with the Rouxbe tomato sauce recipe two nights ago and then used that to make a lovely olive and caper sauce (with a bit of red chili and parsley) to top grilled tuna steaks. Served that with steamed potatoes and a nice little salad. Success. Tonight, the sauce was used to make the chicken parmigiana, after adding a bit of torn basil. Followed the recipe to the letter, including the bread crumb instructions (so much better than the store-bought variety). Served it with spaghetti aglio e olio and some rapini with lemon and garlic. Dessert was the torta al vino made with luscious blackberries. Thank you, Rouxbe. Served this for dinner today. I've never had this dish before, but I knew it would be a winning combination. And it sure was. The breadcrumbs were awesome (who knew one could get so excited about dry bread, eh?) and made the chicken very tasty. Thumbs up, thanks for the recipe! Glad you enjoyed the dish Christian. And as far as getting excited about dry bread crumbs, don't worry, you are not alone :-) They are pretty darn good and they sure add some nice flavor and texture. Cheers! So glad that you liked the recipe. But it's important to know that a recipe is just part of the equation—the person executing the dish also has a big part to play in the making of a good dish...so good job to you!!! What a fantastic way to practise your breading skills. I made the sauce with the best San Marzano tomatoes and tomato purée. I followed the recipe but added a pinch of chilli, dried oregano and honey. It tasted amazing! I too missed the crisp on the chicken but it was so moist and not over cooked, with great flavour from the italian breadcrumbs :) Rouxbe is the best! Can't wait to learn more skills. I'm a bit confused at the recipe. It mentions using the Rouxbe recipe for italian breadcrumbs, and in that recipe it already adds a lot of parmigiana cheese. Then, in the recipe for the chicken, the first step is to add parmigiana cheese to the breadcrumbs. If I use the Rouxbe italian breadcrumb recipe, am I to add the cheese again later, or do I skip adding the cheese a second time? The confusion is because the parmesan was optional in the Italian bread crumbs, Therefore, I have simply removed it from that Italian breadcrumb recipe and just left it in this recipe here. Cheers! Thanks Ken and Dawn, I'll be making this tonight and will leave it out from the breadcrumbs and put it in for the recipe - just to keep the breadcrumbs more neutral for other uses in the future. How far in advance can this dish be prepared? And is it better to freeze it straight away and cook from frozen if it needs to be done in advance? This tasted fantastic! I used gardein chicken breasts instead of regular chicken, but it worked perfectly. 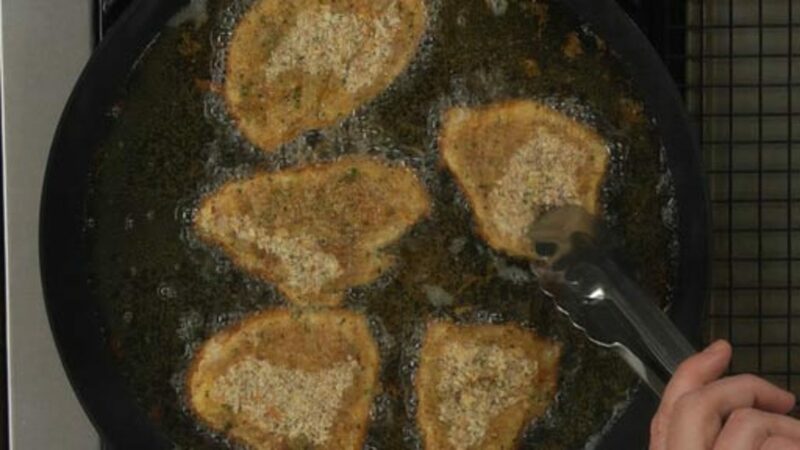 This was the first time fried something with that much oil. I used canola, because it was the only high heat oil I had in the house. It really smelled intense, even before I put the cutlets in...almost like fish (which is a very strange thing for a vegetarian's house to smell like). Was that just because of the canola? Does frying always smell so intense? Was the oil too hot? Although the house smelled funny for a couple days, the dish was superb. Hi Ken! Thanks so much for your reply! I checked the canola, and it smelled fine in the bottle. If it smells fine in the bottle could it still be rancid and then smell when it is used in the pan? I use a cast iron le creuset. The oil did smoke a little bit - maybe it was too hot? Would that cause a smell? Or does frying just have an odor? Cheers and Thanks! Wow, this was delicious! The extra work of making everything homemade pays off! I also brined the chicken breast because I always brine chicken breast. It makes it so much more moist and forgiving. I also tried using fresh mozzarella on a few pieces of chicken instead of grated normal mozzarella. The fresh was much better in my opinion. I added a side of olive oil pasta. It was amazing! Next time I will serve with some salad, I didn’t have time this time. Maybe caprese salad, maybe regular.